Astrophotographer Giuseppe Petricca took this image from Pisa, Tuscany, Italy. The International Space Station streaks over Italy's famed Leaning Tower of Pisa while the moon and three planets shine bright overhead in this stunning image from a night sky photographer., the Moon, Venus, Mars, Mercury and the Leaning Tower of Pisa are all showcased in this stunning image. 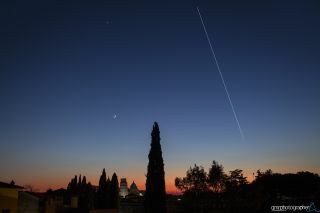 Astrophotographer Giuseppe Petricca took this image from Pisa, Tuscany. In addition to the moon and International Space Station (ISS), the crescent moon, Venus, Mars and Mercury are all visible in the night sky. The crescent moon can be seen on the left of the Leaning Tower of Pisa. Venus shines brightly while Mars and Mercury are fainter to the eye. He used a Canon EOS 700D on tripod, with 18-55mm and IS STM Lens. Editor's note: If you have an amazing night sky photo you'd like to share for a possible story or image gallery, send images and comments in to Space.com at spacephotos@space.com.